We sell appliances, and ventilation is what our clients most overlook and undervalue in their kitchens. But for the health and safety of your appliances, your home, and your family; you need to get it right. 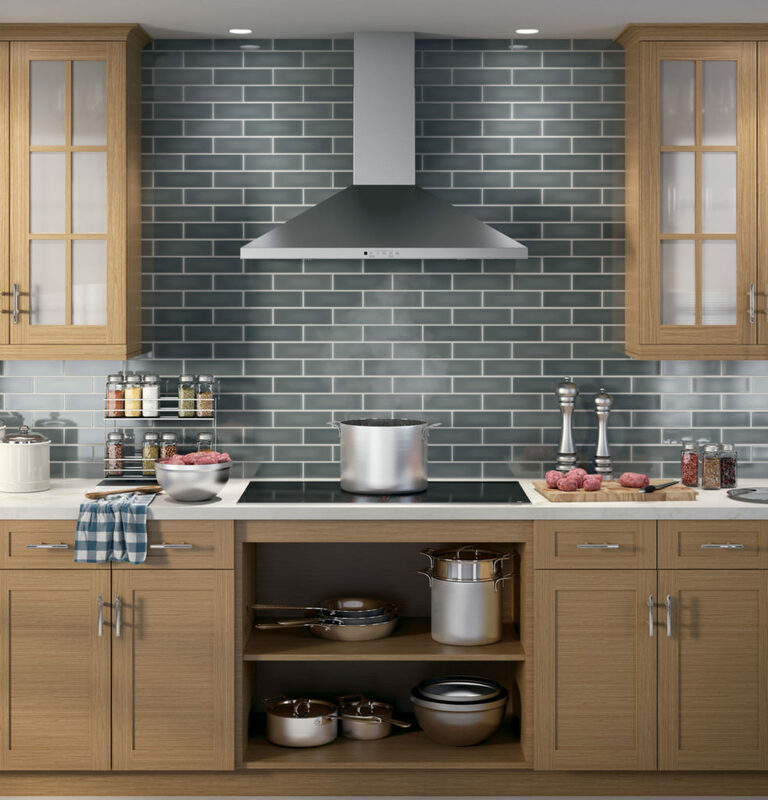 A ventilation appliance is the most important part of your kitchen. Shocked? Don’t be. Your range ventilation is responsible for removing heat, odours, particulates, and harmful fumes from your home. Get it wrong and you could end up damaging your appliances, harming your air quality, or even worse starting a fire. If you’re thinking about remodelling your kitchen or even just upgrading your cooking appliance then you need to be considering your ventilation solution. Like right now. The first thing you have to do is calculate how much ventilation you actually need. Ventilation strength is measured in CFM or cubic feet of air moved per minute, and blowers range anywhere from 200 CFM to 2000 CFM. Start by measuring your cooktop. It’s recommended that you have 100 CFM for every 12 inches of cooking space so a 30-inch cooktop would require 250 CFM. For an electric cooktop, that’s probably plenty – but gas is a whole other story. Gas generates more heat and more emissions than electric cooktops and needs more CFM per inch. To calculate the minimum CFM you need above a gas cooktop, add 100 CFM for every 10,000 possible BTUs and at a minimum, many building codes require 400 CFM above a gas cooking appliance. The length of your ductwork, as well as the type of food you cook, can also affect your CFM requirements. Be sure to speak with a professional installer if you have any concerns before you buy. Once you’ve determined your CFM, it’s time to choose your new hood, and your kitchen design will go a long way to determining what type of hood you end up with. 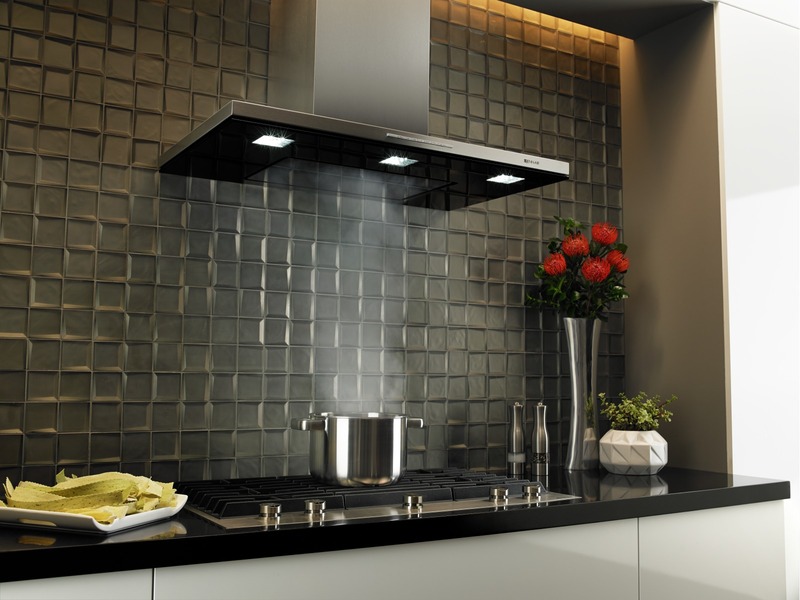 Chimney style or pyramid hoods are amongst the most popular. Available in a wide variety of shapes and sizes. These units mount to the wall above the cooking surface and duct through a chimney vertically to the roof, or horizontally to an exterior wall. Under cabinet hoods, vent similarly but they’re mounted under cabinetry (duh) and typically aren’t as deep as a chimney design. Similarly, inserts and liners are installed inside an existing cabinet or fascia and are hidden from sight. 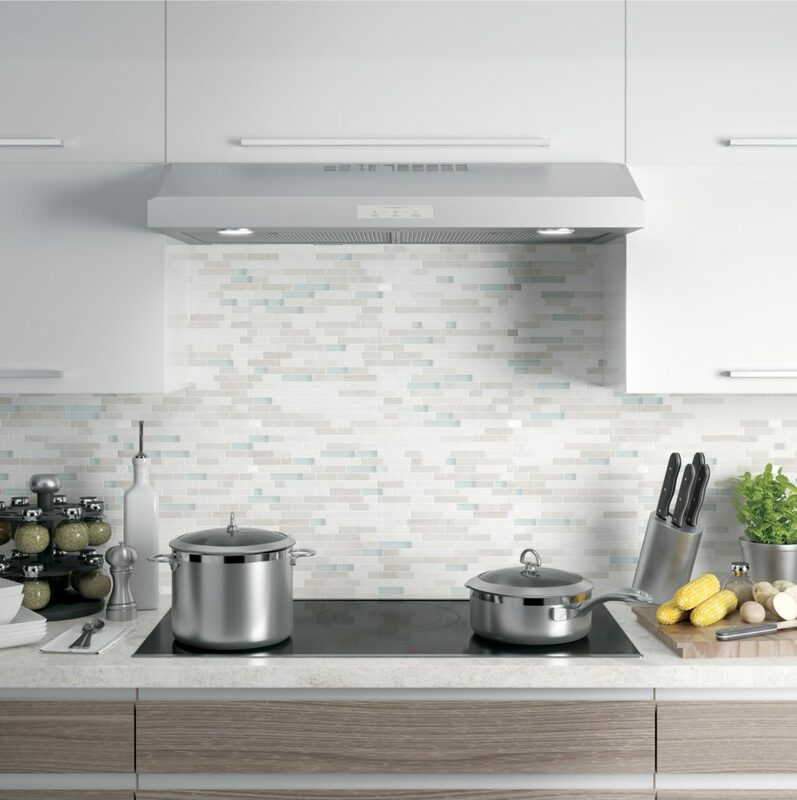 If you’ve got an island design, or your cooktop is installed away from the wall then you’ll need to consider an Island Range Hood. 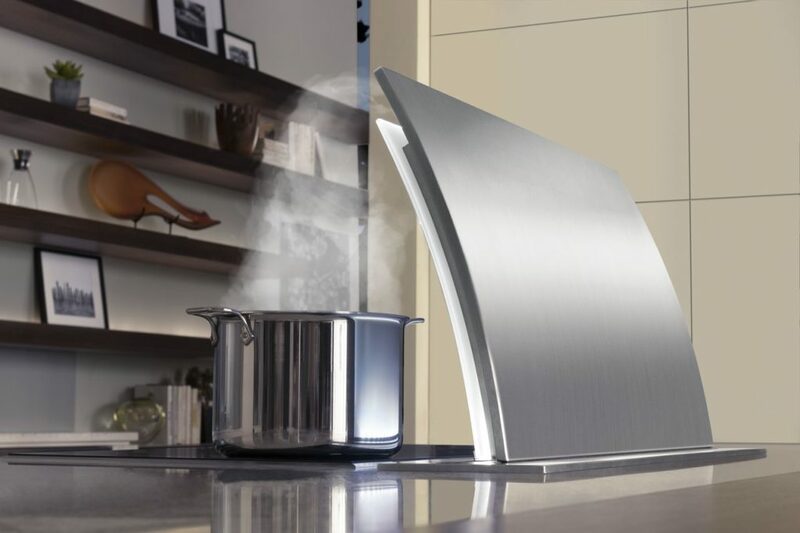 Similar in appearance to a Wall Mounted unit, Island hoods have in comparison a 3360-degree finish. Expect to pay a bit more for island hoods as they typically vent vertically through a chimney duct to an external cap on the roof. Finally, downdraft ventilation is installed in the countertop next to the cooking appliance. 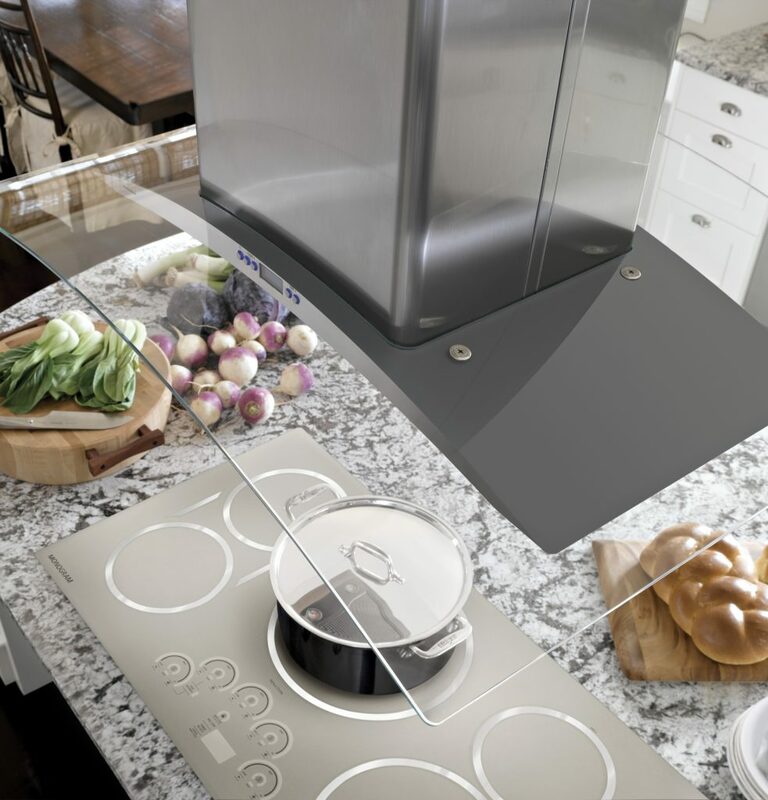 It draws air down from the cooking surface and vents it downwards where it is either recirculated or vented outside. Most models lower into your countertop when not in use. The last thing to consider when choosing a ventilation appliance is the position of the blower. You’ll have three options; interior blower, inline blower, and an external blower. An internal blower is mounted in the hood, an inline blower is mounted along the ductwork inside the house, and an external blower is mounted in an enclosed unit on your home’s exterior. Choosing the right ventilation for your home will depend on your budget, your tolerance for noise and your CFM requirements. So feel free to speak with a sales professional before heading off to your local Brandsource retailer to buy.